As the state of North Carolina ends its Sesquicentennial commemoration of the American Civil War, we are fortunate to receive a valuable addition to North Carolina Civil War scholarship here at the State Archives of North Carolina. The Military Collection at the State Archives of North Carolina is in the process of acquiring, through a generous donation by the family of John M. McBryde, an original Civil War diary kept by Thomas K. McBryde, a Third Lieutenant in Company G (the “Highland Boys”), Twentieth-fourth Regiment, North Carolina Troops. McBryde was from Robeson County, North Carolina, and served in the Confederate Army from May 1861 through the end of the war in 1865. Cover of the Thomas K. McBryde diary. Much of McBryde’s diary consists of short daily entries for the period of 1861-1862. Some of the pages have been torn out, and some periods of inactivity resulted in McBryde not writing anything down. He did have a habit of listing the names of all of the men in his company, along with commanding officers at various periods. The diary begins in March 1861, and ends in September 1862. The diary is fragile, and will need to undergo preservation work before it is made available to the public. 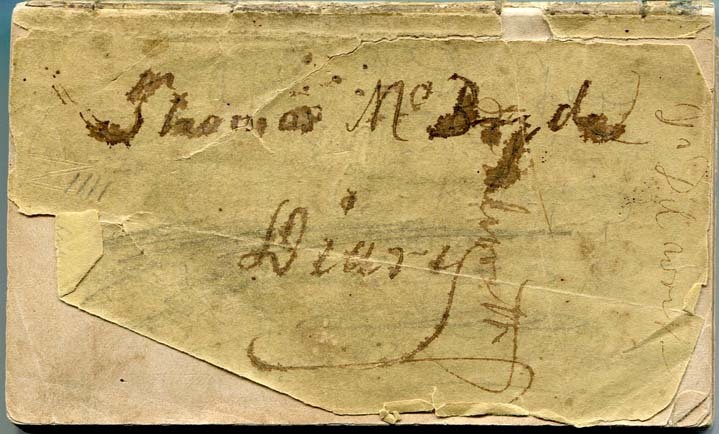 We are fortunate in having a hand-written transcription of the diary, created by Thomas McBryde’s granddaughter, which will allow the State Archives to provide textual access for the diary to researchers until a full, typed transcription can be made available. Thomas K. McBryde was born on January 28, 1842, in Robeson County, North Carolina, to Malcolm and Mary Gilchrist McBryde, who were of Scottish descent. Thomas McBryde attended the University of North Carolina from 1856 to 1857. He would serve in Company G (nicknamed the “Highland Boys” after their Scottish Highlands’ heritage) in the Twentieth-fourth Regiment of the North Carolina Troops during the war. McBryde served from May 1861 to June 17, 1865. He was a Sergeant who was promoted to 3rd Lieutenant on January 1, 1863. On March 25, 1865, McBryde was captured near Fort Stedman, Virginia, by Union forces, and confined at the Old Capitol Prison in Washington, D.C. He was transferred to Fort Delaware in Delaware on March 30, 1865, where he remained until he was released after taking the Oath of Allegiance in June 1865. Thomas McBryde returned to Robeson County after the war to work as a farmer. He would go on to hold a distinguished political career. In 1882, Thomas McBryde married Mary McDuffie, and the couple would have six children together. Thomas McBryde served as Robeson County Commissioner from 1888 to 1892, and chairman of the Democratic Executive Committee from 1894 to 1896. In 1903, McBryde was elected as a State Senator to the North Carolina State Senate. After moving to Hoke County, North Carolina, McBryde was elected as a Representative to the North Carolina General Assembly in 1913. Thomas K. McBryde died on March 5, 1918, in Blue Springs Township in Hoke County, North Carolina, at the age of 75. He was buried in Spring Hill Cemetery in Scotland County, North Carolina. Thomas McBryde’s diary provides us with the following interesting details about his military service not available in most Civil War records. What follows is a brief service and unit history compiled from his diary. Thomas K. McBryde was in Texas as of March 1861, possibly visiting McBryde family members who had moved to Texas prior to the Civil War. He arrived in northern Robeson County, North Carolina on March 24, 1861- some twenty-two days before President Abraham Lincoln called for 75,000 troops to be supplied to squash the secession of Southern states from the Union. North Carolina seceded from the Union on May 20, 1861. Thomas McBryde enlisted formally in the Twentieth-fourth Regiment, North Carolina Troops, on June 4, 1861. It appears that McBryde was going to enlist in a Federal Army unit prior to May 1861, but he quit on May 1, 1861, as tensions rose between North Carolina and the federal government. He joined the 14th Regiment of North Carolina Volunteers on May 15, 1861, and they went into encampment on May 27, 1861, at Floral College in Robeson County. June 4th was the day that McBryde got his officer’s commission as a Sergeant in the newly-formed Twentieth-fourth Regiment, North Carolina Troops. In August 1861, Thomas McBryde’s “Highland Boys” were ordered to western Virginia, serving in the Appalachian Mountains under the command of Confederal Brigadier General John Buchanan Floyd (later commander of Fort Donelson in Tennessee) in the Confederate Army of the Kanawha. McBryde’s company remained in western Virginia until December 5, 1861. By that time, McBryde’s regiment was transferred under the command of General Robert E. Lee, of whom McBryde observed in his diary: “then we were put under the command of General Lee—the great general who have all confidence in as a man inferior to no one. The Yankees feared him greatly as a leader and retreated soon after we were put under his command . . . .” McBryde’s unit was stationed in Meadow Bluff, Virginia (now West Virginia), working on fortifications in that area in September 1861. McBryde and his men first encountered the Union Army (in a manner of speaking) on September 28, 1861, as they could “hear the music of the Yankees” and were “in expectation of being attacked” on September 29th. Although such a military engagement with the Union forces did not materialize at that time, the Twentieth-fourth Regiment was devastated by illness and inadequate provisions, as McBryde notes in the diary during the construction of fortifications. After a furlough to Robeson County in December 1861, McBryde’s company returned to service at Petersburg, Virginia, in January 1862, where McBryde would attend the local Presbyterian church. He remained stationed in Petersburg until February 12, 1861, during which time he took part in city life and Army activities. Thomas noted humorously on February 4, 1861, about a drill: “Raining in the morning, clear in the afternoon. Had a bogus dress parade by Major Evans (drunk)” (believed to be Jonathan Evans, major of the Twenty-fourth N.C. troops). McBryde also made poignant observations about the loss of men who served in his regiment: “Attended John Little’s funeral. Poor fellow. he was good and a noble man. he had his faults but who has not.” Thomas McBryde’s regiment was sent to Norfolk, Virginia, in early March 1862, where he witnessed the Battle of Hampton Roads, and describes hearing the ironclad ship CSS Virginia, as he writes it, during its battle with the USS Congress, of which he notes hearing the Congress “blew up with a terrible explosion.” Hampton Roads was the site of the famous battle between the ironclads Virginia and Monitor, and is documented in several entries in McBryde’s diary. His company was ordered to Murfreesboro, North Carolina, after Hampton Roads. Thomas McBryde later details his company’s involvement in the incursion of the Confederate Army into Maryland in 1862, and discusses the Battle of Antietam, Md. McBryde writes a list of all of the men in his company following the Battle of Antietam, and notes the number of men killed or wounded in the battle. The end of McBryde’s diary was written in 1918 by a family member after the death of Thomas McBryde on March 5, 1918, and includes McBryde’s service history in the Civil War and a list of the men in his unit. This wonderful diary is a rare insight into the early period of the Civil War, and is an invaluable documentary source of the experience of a North Carolina officer in Virginia and eastern North Carolina during the war. We are grateful to the family of John M. McBryde for entrusting the preservation of this diary to the State Archives of North Carolina and the Military Collection, and for recognizing the diary’s historical research value for members of the public. Should anyone be interested in learning more about McBryde’s diary, or should anyone have original North Carolina Civil War records or photographs they might be interested in donating to the State Archives of North Carolina, you can contact Matthew Peek, Military Collection Archivist at the State Archives, at (919) 807-7314, or email him at matthew.peek@ncdcr.gov. You can also learn more about the Military Collection by checking out their webpage at http://archives.ncdcr.gov/Public/Collections/Non-Government/Military-Collections. This entry was posted in News and tagged civil war diaries, diaries, Military Collection. Bookmark the permalink.